One of the ways that I changed things up in my classes this semester was to switch to a workshop format. While I have incorporated low-stakes writing into my classes for a long time, it was only this semester that I began every single class with writing. Bell ringers are not a new invention. Many teachers create, adapt, or steal a variety of assignments to keep students busy while they deal with attendance and other housekeeping. I often use them to set up my lesson for the day, but this semester I built my class around the bell ringer and this small change had a dramatic impact on my classes. As my classes are writing classes, all of my bell ringers were writing prompts but Tod Finley’s bell ringer article offers other options. One of my favorite strategies is to use quotes as the writing prompt and usually I give students a selection to choose from. For example, the first class of my general education writing classes I asked students to share a favorite quote about education and then for the next class they had to choose a different quote from the collection to write about. For another class, because my classes are built around pop culture ideas, I share quotes selected from a variety of sources from Star Wars to children’s literature (see a few examples here). Of course, photos, music, objects or even food also make great writing prompts – or change it up for every class so students never know what will be used to prompt their writing. 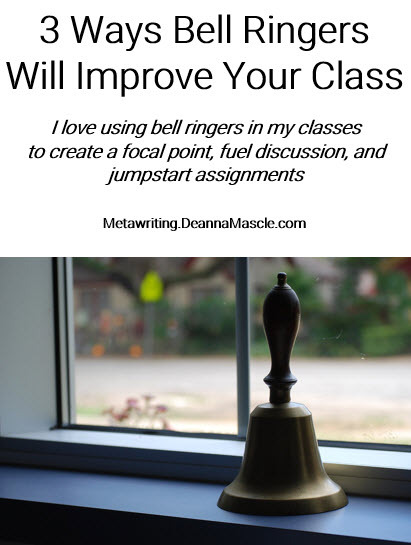 Here are three ways that bell ringers improve my classes. Kicking off each class with a targeted writing prompt underscores the theme for that day’s class. It was clear to everyone what we were going to focus on that day. Posting the prompt before the start of class and establishing the practice of students writing at the start of class made the transition into class time easier for everyone. After only a few classes, students easily fell into the pattern of settling into writing without prompting. Finally, thinking and writing about the prompt helped both myself and my students get our heads into the game. The practice gave us time to gather our thoughts and access our existing knowledge about the topic so when work began in earnest we were ready. In my classes, bell ringers are always directly tied to the topic of the day. This strategy means that when the time comes for class discussion everyone has something to say. Spending time writing about one or two specific ideas or questions before a discussion ensures that everyone has some thought to contribute to the conversation. I often ask students to sum up their writing with a six-word story before we transition from bell ringer to class so students have the option to share selections from their writing or their six-word story (with explanation). I have found as students become comfortable with the bell ringer model that I need to prompt less and talk less during our class discussions. I love to jumpstart writing assignments with two or three successive bell ringers. It is less intimidating for students to be told about an assignment after they have already written hundreds of words on a topic. Also, I find there is a lot less struggle about selecting a topic or focus for an upcoming assignment if we have already explored possibilities through bell ringers paired with discussion. I love using bell ringers in my classes to create a focal point, fuel discussion, and jumpstart assignments. How do you use bell ringers in your classroom? What is your favorite way to start a lesson? How do you engage students before a lesson?